Stylish checkered top. Cross back, fluttered bell sleeves. 100% Polyester - Air Dry. Comes in sizes: Small; Medium; Large. 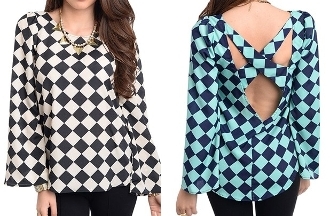 Comes in colors: Black/White; Navy/Mint.